I started my first AR15 build way back in 2010. 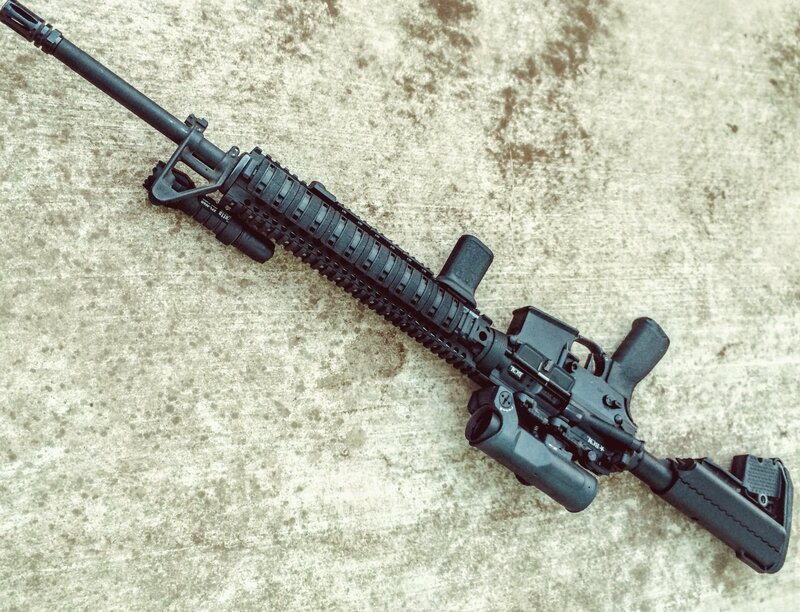 At the tail end of that first iteration, I agonized over what optic should go on top of my “general-purpose-SHTF-WROL-ZPAW” build. Obviously, my priorities and maturity have changed a lot since then. At the tail end of 2011, my choices came down to the TR24G and a TA33G-H ACOG. On the recommendation of “the internet” I chose to go with the TR24G. Since then, the number of choices in the 1-4x optic class has grown by leaps and bounds. New reticle designs and all sorts of whiz-bang features keep coming to the market and prices keep falling. In fact, 1-4x seems downright old-fashioned in a market where 1-6x and 1-8x is the new standard. Despite that, the TR24 still holds its own. I’ve used this scope in amateur three-gun, mid-range range precision, tactical training, and my own marksmanship practice. Since 2011, the only hiccup I’ve had was one of the turrets popping up from the “locked” position inside the cap. I lost my zero right before a three-gun stage. That was easily rectified with a quick field zero. The optic itself is 10.3 inches long, has a 24mm objective, and a 30mm tube. The tube is made of 6061-T6 aluminum and it weighs in at 14.4 ounces by itself. Add another 7.1 ounces for the ADM Scout Mount and the total comes to about 21.5 ounces, theoretically. Measuring it myself on my food scale with the TR24G, ADM Scout Mount, and a 3gunstuff cattail, the total was 20.9 oz. That is on the lighter end of all low power variables on the market, but heavier than a quality fixed magnification optic. The TR24 comes in three different reticle patterns: a triangle post, German #4 crosshair, or a simple duplex. The latter two have only a tiny illuminated dot in the center that lends itself to better precision. The lighted triangle of my model is geared more towards speed. Regardless of version, the reticle is in the second focal plane and the capped turrets are 1/4 MOA. The eye relief is advertised at 3.2″ and I found it to be about right, if not just a hair shorter than reality. Some people talk about the eye relief of the TR24 changing as you zoom through its magnification range. This is not actually the case, though. What they are actually seeing is the changing size of the exit pupil. At 1x, you can move way behind the scope and still have a usable sight picture, very similar to a red dot sight. But that doesn’t mean your eye relief is changing. If you use a proper cheek weld and position the scope accordingly (while at 4x), you will never have to move your head as you zoom back down to 1x. The field of view at 100 yards is 97.5 ft at 1x and 24.2 ft at 4x, or about 4.2 degrees at 4x. That is eight feet less than my ELCAN SpecterOS 4x, but more than the 19.3 ft of the competing TA33. The pictures show the ELCAN and TR24G looking down a street in front of my house; you can see what the wider field of view looks like. I’m not saying that looking through the TR24 is like looking through a straw, but it is noticeably narrower. However, the TR24G still has the advantage of zooming down to 1x and practically appearing to be a red “dot” sight. The glass of the TR24G is Japanese and very clear, as is standard for Trijicon. It is not as clear as the ELCAN, but the difference is very small and not worth worrying about in realistic terms. My TA110 ACOG still beats both. I think this has more to do with the size of the objective lens than anything. I see no issues with edge to edge clarity or fish-eye effects. Some folks have complained that the scope is “not really 1x.” They forget that the image is “taken” from the front lens which is a good 14″ in front of your eye. No rifle scope using lenses will achieve the same zero magnification as a red dot sight. Beyond about 10 yards, it appears to be effectively zero magnification. The reticle in the TR24G is a simple post and triangle. The triangle on the post is illuminated by fiber optic spool located by the ocular. Mine is green, hence the “G” in the name, but it also comes in Amber or Red– TR24A and TR24R, respectively. There is a rotating cover that lets you control the amount of light entering the fiber optic element. The newer 1-6x generations changed to a different type of cover, but the principle is still the same. This cover is useful for moments where I want maximum sharpness on the reticle and blocking illumination makes the post become a nice sharp black triangle. In full sun, the fiber optic is almost retina-searingly bright. Washout is never a problem. A view through the TR24G set at 1X and the fiber optic fully exposed, though without direct sunlight. The reticle is very bright and easy to pick up. Like an ACOG, there is a tritium vial embedded in the TR24 to provide some illumination in a low or no light environment. You cannot control the brightness of this component. The tritium illumination works best when your eyes are already dark-adjusted and it works well. Some people try to judge tritium illumination by walking into a dark room and looking through the optic. This is not a good representation because your eyes need at least thirty minutes of darkness to chemically adjust to the low light environment. Tritium is a radioactive isotope of hydrogen that slowly decays into helium. It has a half-life of about 12 years. how long the tritium in my scope lasts has a lot of factors such as when the vial was made and how much tritium is required in order to sufficiently illuminate the fiber optic. Trijicon will replace the tritium vial once it is no longer providing enough illumination. I’ve heard mixed answers about the cost of the replacement though, so you’ll have to ask them. At 4x, the triangle of the reticle is 4.2 MOA tall. The post and triangle design limit the usability of the TR24 reticle for holdovers and BDC references. In contrast, ACOGs and ELCANs have useful stadia lines for a nominal ballistic calculation. Newer 1-4x/6x/8x scope designs also include BDCs or MOA/Mil markings. Due to the lack of usable reference marks, this post-style reticle is best geared towards using a point blank zero (PBZ). It would also work well for Sniping 4th Generation (S4G). The post reticle of the TR24G works best from point blank to about 350 yards, depending on the chosen PBZ. Obviously, it’s nice to have an optic easily used out to 400, 500, 600, and 700 yards. But, being realistic, the 5.56 cartridge and M16 rifle were developed primarily for 300 yards and closer. The TR24G is a great general purpose optic for a “set and forget” type of zero, but will be outclassed by some of the newer designs out there. The adjustments are in 1/4 MOA increment. As I said earlier, I once had an issue with the windage turret popping loose within the cap and losing my zero. I cannot explain how it happened, and it has never happened since then. I don’t have the means for doing a formal box test, but the turrets seem accurate and repeatable for getting to a zero. I’ve tried replacing this optic over the years, yet I keep finding myself coming back to it. Since I purchased this in 2011, Trijicon released a 1-6x version. They’ve also put out a battery-powered Accupower line. Both options have few new reticle designs that include MOA hash marks or BDC stadia lines. This optic is ‘old reliable’ for me. With a carefully chosen point blank zero, this little scope is very fast to use. It really shines from 0 to 350 yards or so. It is not as precise as a dedicated crosshair, nor as useful at range as an ACOG. Still, it is faster than both up close. So who should buy this? Well, that’s a tough one. This optic is showing its age in design features compared to scopes that are new on the market. Trijicon itself has updated the Accupoint line with a 1-6x version that is priced about the same. The scope is well designed and tough. It is very fast and makes an ideal scope for situations in which speed is more important than precision. This is especially for the realistic distances an AR-15 will be used. However, when precision becomes important, the lack of usable reference marks and covered turrets limits your options. Would I buy it again? Absolutely, but I would definitely be shopping my options among the ACOG line and other newer battery-powered options. Specifically, for not much more money, I would be looking at the Accupoint 1-6x or the Vortex Razor II 1-6x options. me revisiting ballistics as short barrels are new to me. Hey Jack, thanks for reading and commenting! Lately, I’ve had a non-scientific approach to it. The TR24 is sitting atop one my 16” carbines. I zeroed it for 50 yards, which is the longest distance my regular range has to offer. I figure that will work well enough for most circumstances since moving to an area with decidedly shorter sight lines. But that’s also contingent on getting some chrono data, which I haven’t done lately. Thanks for the reply. Supposed there will be no short cuts for me with the SBR. Just have to do some T&E.